Home page that allows user to input parameters for searching. Result page that display the current page of results. This page can also accept user’s new search request. 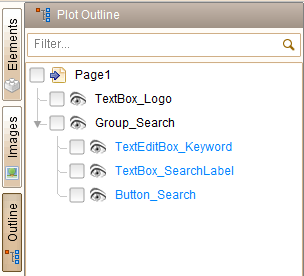 Create a new plot, and set its page size to 1000×750, via the “Plot Settings…” button on the bottom right corner. Now we are editing the first page (home page). Click the button at the bottom to open the page management view, set the current page title (on the right of the view) to “Home Page”. Click the button to add a new page, and set its title to “Results”. The newly created page will be selected automatically, so now we can edit its content. Now we are goint to make use of the Reference element. The Reference element is quite special: it can simulate the look and functionality of another element (which is called “reference target”), this can help us to reuse the previously defined elements to build new content. 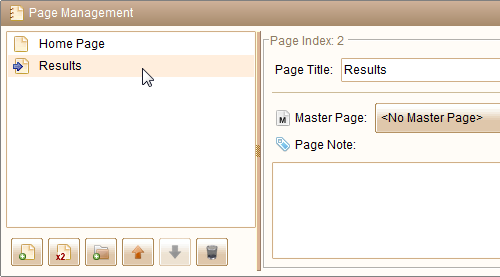 Once you see this window, you can browse to any page to pick the element you want, as the reference target. Here I will choose the logo text box, because I will also need the logo in the result page. Finally, we add two Button elements and one Text Box element to create the pagination bar on the bottom. Now we have finished the GUI creation. Although no behavior is defined yet, you can still run the simulation and browse the two pages via the navigation bar. 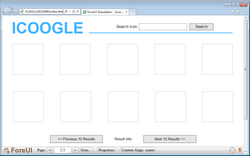 As I said, I will create a working icon search engine with ForeUI. I could achieve it thanks to the possibility that ForeUI could talk to the web service via JSONP API. In this example, I will use the JSONP API provided by IconFinder. You can find more details about this API here. In order to use the API, you will need to sign up on IconFinder and get your own API key. For testing purpose, you could temporarily use our API key (8b3d4114b9994b188cef5bcef9765444). 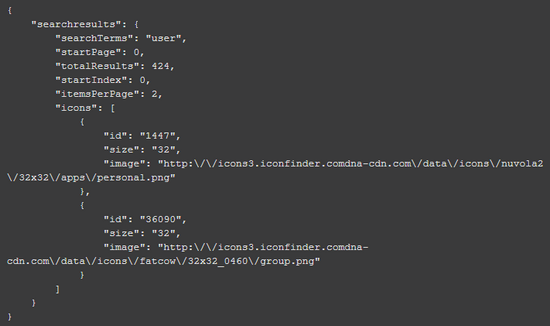 That means we can get total results number (the “totalResults” field) and all icons’ information (the “icons” array field) from the JSON object, which can make ICOOGLE functional. Behavior definition is very interesting, and could be challenging in some cases. Since ForeUI allows you to define behavior in a simple and direct way, you don’t have to be a programmer. However it will be better if you could think like a programmer, since that will help you to make neat design of the behavior. 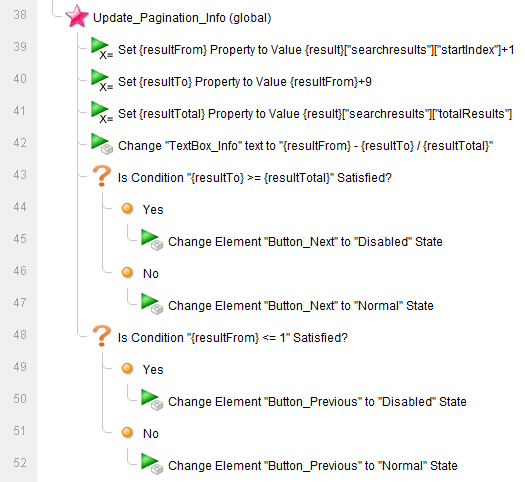 First we need to define a custom property to store the current page. We will include this property value in the URL for calling the API. 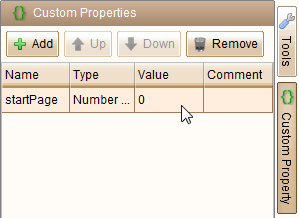 The custom property can be defined in the custom property view, which can be opened by clicking the “Custom Property” button in the right bar. User click the “Search” button in the home page. User click the “Previous 10 Results” button in the results page. User click the “Next 10 Results” button in the results page. We can let these three cases to share the same behavior, with different parameter (the page index and searching keyword). So I defined a global custom event and put the searching logic into its handler. This is very similar with the “function” concept in programing world: Three buttons will call this “function” to do the searching. You can see the keyword and the page index is included in the URL. This API call will return a JSON object, which will be assigned to a custom property named “result”. That means, when the Get JSON action finished, we will have a custom property (with “object” type) that includes all needed information for showing the result. As you can see, there are two actions to trigger another two custom events (line 4 and line 5): Update_Result_List and Update_Pagination_Info. It is not a must to define these two custom events, since you can put their logic into the Do_Search event handler. The reason that I do so is to make the structure more clean. The triggering of another custom event is quite similar with the “function call” in the programing world. The final step is go to the results page, using the “Go to Page” action (line 6). 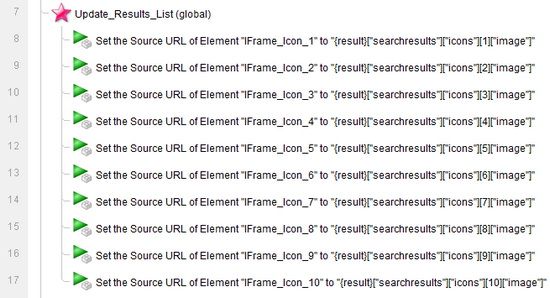 It is just getting the icon URLs from the “result” object, and assign them to the iFrame elements (so you will see the icon in results page). Keep in mind that arrays in ForeUI is 1-based, so first member in array is array. It makes use of the information in the “result” property and constructs the current paging information. So far we have define the main logic of searching, but no one is using it yet! We need to handle the “Element Clicked” event for all the three buttons and trigger the “Do_Search” custom event in the event handlers. It is very easy to understand what they do: set the “startPage” property before doing the search, then we will get different results. Now we have define the basic behavior of the web application. 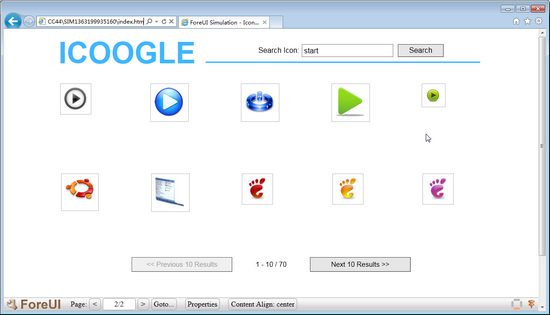 You can run the simulation, input a keyword, press “search” button, and you will see the icons listed in the results page, you can even switch pages. The icon list should be cleared before listing the result, otherwise the icon from previous searching may be kept in the result page. 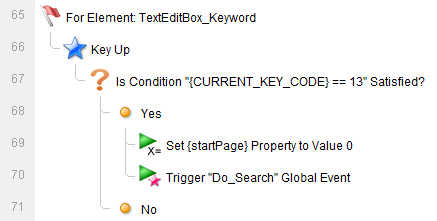 In order to start searching after pressing ENTER, you will need to handle the “Key Up” or “Key Down” event for the Text Edit Box element, and check the CURRENT_KEY_CODE system property value. If the value is 13 (the code for ENTER key), we will execute the same logic with the “Search” button. PS: all possible system properties are listed in the system property view, which can be opened by clicking the “System Property” button on the right bar. Also I modified the “Update_Pagination_Info” event handler a little bit to enable/disable the “Previous” and “Next” buttons according to the current showing range: if the first listing result is less than or equals to 1, the “Previous” button will be disabled; if the last showing listing result is larger than or equals to the total number of results. The “Next” button will be disabled. The icon border is actually from the iFrame element, so we will need to resize the iFrame element according to the actual icon size (reserve 20 pixels as padding). Simply set the source URL of the iFrame element to “about:blank” will clear its content. You can run the simulation directly from this link. You can also download this example plot in ForeUI store. I’d like to use this tutorial to show what can be done with ForeUI, and attract more and more users to try the advanced features in ForeUI. 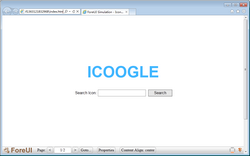 PS: ForeUI is still a prototyping tool, although it could be used to create the frontend of real web application. You can just use the basic features to create fast prototyes of your web site or software. If you wish to get higher fidelity of the simulation or even use it in production, ForeUI is ready for that.